Texts about the Co-Axial Escapement are filled with adjectives like “radical” and “revolutionary”. Are you comfortable with these descriptions? I am comfortable with hearing the Co-Axial escapement described that way because it is, in fact, revolutionary and radical. The Co-Axial Escapement solves a problem which had been perplexing watchmakers for 500 years and that is the problem of lubrication. Is there room for another major breakthrough as dramatic – as radical and revolutionary – as the Co-Axial Escapement in mechanical watches? It might sound immodest to say it but I honestly don’t think so. Mechanical watches have a long history and the challenges of improving them have been taken on by centuries of master watchmakers. The problems of the viscosity of lubrication and the need for lubrication caused by sliding friction had been addressed by watchmakers for hundreds of years and not solved until the introduction of the Co-Axial escapement. Different materials may be used in the construction of certain parts of the movements but these won’t affect a watch’s fundamental performance in the way that the Co-Axial Escapement does. Will the Co-Axial Escapement, in time, be the most widely used escapement in the construction of new mechanical watches? The watch industry is by nature very conservative and slow to adopt new things. But basically, every maker who continues with other escapements will ultimately be trampled by the Co-Axial for the very simple reason that it’s better. OMEGA have been able to show that the Co-Axial Escapement can be serially produced on a large-scale so while it will take some doing to convince the mechanical watch industry, it’s just a matter of time. Are you surprised by the renewed popularity of mechanical watches? No, I’m not surprised by the renewed popularity of the mechanical watch. I have often said that I’ve never been in doubt that the mechanical watch would survive and I started its revival with my first watch fitted with the Co-Axial escapement in 1969 in London. My mantra has long been that the survival of the mechanical watch is ensured by its qualities: it’s historic, technical, intellectual, aesthetic, useful and even amusing. These properties have sustained the popularity of mechanical watches through the ages and are bound to carry it well into the future. Having said that, a generation ago the mechanical watch was in need of improvements which would prevent its attractions from being overshadowed by quartz timekeeping. That, in short, is one of the real benefits of the Co-Axial Escapement: it will play a major role of extending the popularity of mechanical watches into the 21st century and beyond. An article in the Financial Times said that you don’t create detailed drawings of your watches until after their finished. Is that true? If so, do you improvise when you are making a watch? It’s true that I don’t create the detailed drawings until after the watch is completed. 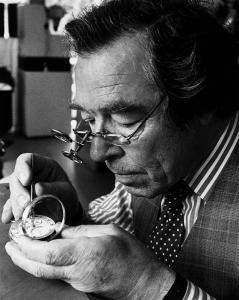 Remember that none of the great watchmakers in the past worked from drawings! When I start a new watch, I have the whole thing in my head. It’s possible that I will make some small revisions as I go along if I think of something which would be an improvement. One of the problems with a detailed drawing of a watch is that the width of a pencil line will sometimes be several times wider than the smallest parts of a watch movement. I should point out that the exception is escapements. Because of the very small tolerances in an escapement – just a few thousandths of a millimetre — detailed scale drawings are made of these. I’ve sometimes created a dozen drawings of an escapement in order to work out its maximum efficiency. 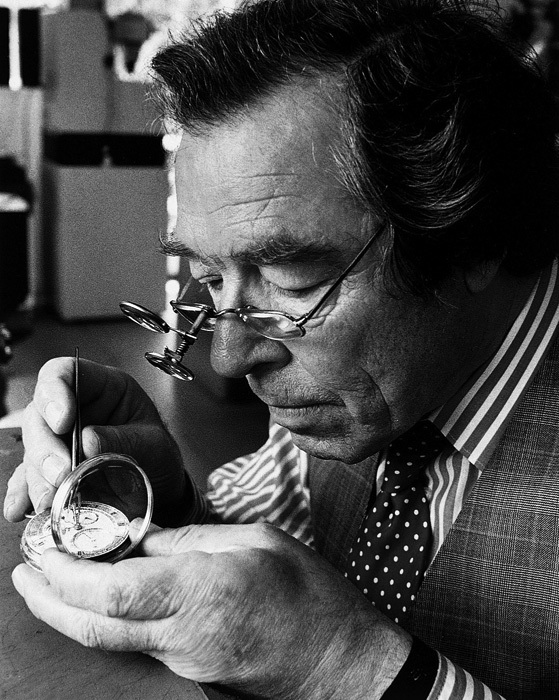 A few years ago, Sotheby’s assembled an exhibit of 36 of the 37 watches you’ve made. Do you have particular affection for any of these or do you love all your “children” equally? There are two for which I have special affection. One is the Grande Complication watch which lives up to its name: it’s a gold one-minute tourbillon with a slim Co-Axial escapement and every possible complication: minute repeating, instantaneous perpetual calendar, equation of time, phase of the moon, thermometer and indication of the reserve of winding. I still have that one, by the way. The other is the Space Traveller. It has an independent double-wheel escapement and also has a large number of complications: mean-solar and sidereal time, age and phase of the moon and equation of time indications. None of these watches were commissioned. All were especially created for experimental purposes. When I started making watches, I had already taken the decision not to make watches to order but rather to make them entirely to my own design and satisfaction. I would seel them when, and if, a suitable client materialised. This year, OMEGA is celebrating the tenth anniversary of the first Co-Axial escapement in an OMEGA calibre. The escapements have been a part of your life for forty years. Are you pleased with OMEGA’s interpretation and introduction of the escapement? When OMEGA made the commitment to produce the Co-Axial Escapement at a series production level I was very pleased. They were brave enough to take on this revolutionary technology in the face of a lot of criticism and scepticism from the rest of the industry. At the time, there was no praise for OMEGA. I could sympathize with them because there had also been none for me when I invented the Co-Axial escapement. Because it is very much my baby, I had intense discussions with a number of their technicians, especially in the beginning. We have collaborated for several years on the specification of the components to define the forms of the special tools needed for production. The Co-Axial escapement is more complex than the classic lever so I kept very close to the technicians during the run up to production. Working with others was a new experience for me and I have very much enjoyed the relationship that developed between OMEGA, its technicians and myself. The end product is most satisfying to see working and it is of course a thrill for an inventor to see his aspirations fulfilled so perfectly. The performance has been remarkable, showing long-term day-to-day use that cannot be equalled by the classic lever escapement. OMEGA is to be commended for their courage in taking on the Co-Axial escapement and I wish them every success with it.